This is the sixth Purana I have read, and in my opinion, it is my third favorite Purana. It is not too long, nor is it too long, it is just right. It only consists of about twenty-five thousand shlokas, and is not terribly long. It is the sixth Purana in order, and has two parts to it. They are the Purva Bhaga (first part), and the Uttara Bhaga (the subsequent part). It has thirty-eight chapters in the whole text. It is a sattvika Purana as you might have guessed, as the name itself says ‘Narada Purana’, and Narada was a great devotee of Lord Vishnu. It is called so, because the Purana was originally recited by Sage Narada himself. Before I start going into the details, read this shloka and recite it, to purify the heart. This shloka means that before reading these texts, one must pray to Nara and Narayana, the best of all human beings. One should also pray to Maa Sarasvati, the goddesses of learning and wisdom. It is only after doing so that one must begin reading the sacred texts known as Jaya. Jaya was first used to refer to the Mahabharata, but it is now said that it also includes the Ramayana and the eighteen Mahapuranas as well. My favorite ones are the ones about Sumati and Bhadrashila. Both the stories emphasize the punya you accumulate if you serve Lord Vishnu in any way, be it knowingly or unknowingly. Let me narrate both to you. Many years ago, during the satya yuga, there lived a good and wise king called Sumati. He was from the lunar dynasty, and was righteous. He was a great devotee of Lord Vishnu. He had a wife called Satyamati. They regularly performed the dhvjarohana vrata. On those days, his wife would dance in temples. Both were Jatismaras, and could remember their past life. One day, a sage called Vibhandaka and his disciples came to visit them. They questioned Sumati, “Why do you perform the dhvjarohana vrata and why does your wife dance in such occasions?” Sumati replied that it all related to his past life. In his earlier life, Sumati was an evil shudra called Matuli. He was a sinner and used to harm people. Due to this, he was abandoned by his family and friends. Matuli then retired into the forest. One day, Matuli was very hungry and thirsty. He came upon a pond, near which was a Vishnu temple. He quenched his thirst and ate Lotus stalks that satisfied his hunger. He rebuilt parts of the temple and built a house near it, and became a hunter. Twenty years passed. He married a hunter’s daughter named Kokilini, who too was evil and had been deserted by her family. They often drank a lot of wine and danced in the temple. During one such time, they died. Yama’s servants came to take them, but Vishnu’s messengers did not allow them to because Vishnu liked them dancing, and after rebuilding the temple, Matuli had hoisted a flag that was performing the dhvjarohana vrata. They were taken to heaven and then reborn as Sumati and Satyamati. That was why they continued performing the vrata and dancing in the temple. Bhadrashila was the son of Sage Galava. From his youth, Bhadrashila was devoted to Lord Vishnu and would make clay models of the Lord. He would tell everyone the virtues of observing the vrata on the Ekadashi tithi. Sage Galava asked his son why he observed that vrata. Bhadrashila was a Jatismara so he recounted his past life to answer his father’s question. He was a king named Dharmakirti in his past life, from the lunar dynasty. He ruled for nine thousand years performing good deeds as well as bad ones. Later, he only started to perform bad deeds. Taking a cue from the king, even his people started performing only bad deeds. A king is entitled to one -sixth of their people’s earnings. The same way, Dharmakirti was entitled to one-sixth of his people’s bad deeds. He slowly exhausted all his punya. One day, he went hunting, and was feeling hungry. Some pilgrims arrived at the spot where he was resting and decided to observe the Ekadashi vrata. He also decided to observe it with them. He was so hungry that he died by morning. When he was taken to Yama’s abode, and Yama got to know that he had performed the Ekadashi Vrata, he let him free to heaven. Therefore, he still observed the Ekadashi vrata. Anyone who reads a single couplet of the Purana is forgiven of all his sins. Someone who reads the entire chapter acquires the punya obtained from various yajnas. If this Purana is kept in the house, ghosts and thieves avoid this house. Arson and theft never happen in the household. 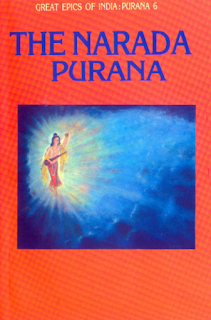 I loved this Purana because it talked a lot about Vishnu, and the story of creation was different in this Purana. It had stories, as well as facts, but none of it was like history, but more like one of the storybooks you read. Interesting and full of stories. I love then parts about the different vratas and the history behind many kings. I have loved this Purana because it talks about important things about our culture in a stimulating way.